Flight or Flight Response. As an acute stress response, this is essentially a basic survival instinct: a comprehensive neurological discharge of the “sympathetic nervous system”, the control system that primes a human or an animal to fight or flee when life is on the line. The sequence is straight forward: once there is a conscious recognition of a significant threat, neural changes in the brain quickly trigger the secretion of the “stress hormones” adrenaline and noradrenaline in the adrenal medulla (an organ attached to the kidneys). Significant release of adrenaline and noradrenaline promptly prepare the body for violent muscular action: Increased blood pressure, heart rate, stroke volume, respiratory rate, tidal lung volume, muscle tone, muscle tension and blood flow to working muscles; pupils dilate to improve vision; Blood clotting function improves (to reduce potential losses); emotional reactions increase, especially anxiety or aggression; and excessive attention is given to negative stimuli, a hypersensitive tendency to overreact. How does this reflex play into open water swimming? If you are relaxed when swimming, without fear, anxiety or expectation, then it is unlikely there will be a significant sympathetic outflow during open water swimming (using an open water siwm buoy can help relieve anxiety). However, it is hard not to get caught up in the excitement and rapid ramp-up of a race. Most competitors can almost feel the adrenaline coursing through their veins even before starting, especially if there are high expectations of performance, or the need to outperform another competitor. Conversely, some may possibly have a fear of not doing well in the face of friends and supporters. 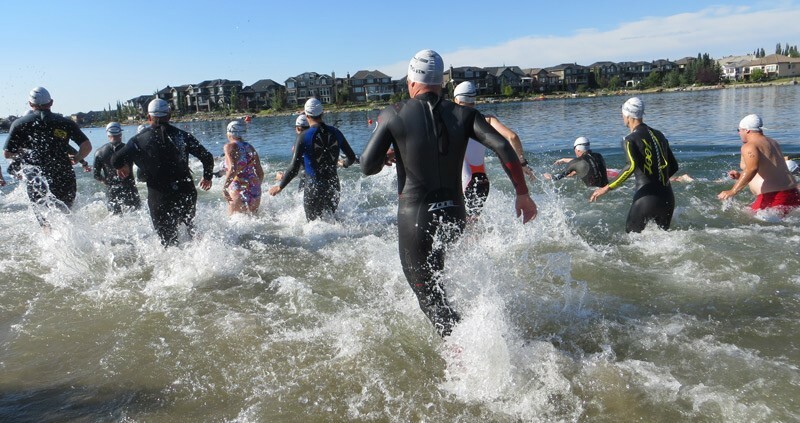 Or worse, some may have limited confidence in their ability to swim in open water, to survive the “washing machine” experience that is often at the start of mass open water swim. Once the event starts, adrenaline causes many to go out too fast, pushing harder than their abilities allow for a sustainable swim. And if in the middle of an intense effort, you miss a breath, or get struck or run over causing anger, aggression and/or a true fear for your life, then this emotional rush will dramatically add to the adrenaline surge already evident at the beginning of the event. Blood pressure, cardiac contractility, heart rate, and respiratory rate can be stimulated to extreme levels, to a point where a latent, previously undiagnosed cardiac problem may be exposed—the heart cannot cope with the demands placed on it—cardiac ischemia (angina) and myocardial infarction (heart attack) become possible. This is not a ladder you want to keep climbing. Staying in control is easier said than done. One way is simply to let go of any expectations of your swim, and to prioritize getting into a comfortable, sustainable rhythm. 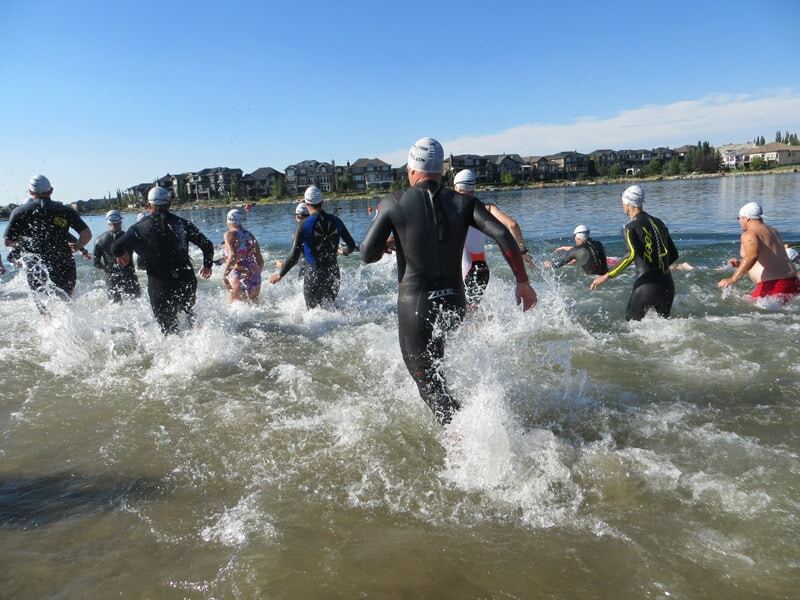 Warm up easily before you start, then find some space at the swim start. Swim your swim, with your rhythm, at your pace, as if you were alone doing it. Never push early in an endurance swim. Autonomic Conflict. After reading the previous post about the diving reflex, which tends to slow things down, and both the cold water shock response and the fight or flight response (above), which tends to spike things up, it is pretty clear that there are hormonal and neurological forces within your body that are in conflict when swimming in cold water. When control systems are giving mixed messages to an end-organ like the heart, there are some significant implications. Recent research has demonstrated that the electrical pattern that controls the rhythm of the heart can become so distorted that the heart can no longer pump blood efficiently. Arrhythmias such as heart block, or atrial or ventricular fibrillation can occur spontaneously and quickly if these reflex inputs are allowed to flourish—and they can be lethal, even in young, healthy and capable swimmers. Simply put, do not let these reflexes rule your swims. Warm up adequately, get gradually acclimatized to the cool water, stay within yourself, and stay true to your capabilities. And it may be better not to compete mass start swims until you have solid confidence in your swimming abilities and lots of experience in open, deep water.